Did anyone notice that yesterday’s sneak peek was my pasta drying rack? Yes, I finally made homemade pasta and concocted this seemingly-weird recipe with it. My parents and SO were super skeptical about this dish, whether it was for the pasta or the contents, I’m not sure. But let me tell you that it turned out so very good. I made this dish for the Oscars, so I made sure to make it as rich as I possibly could, without it turning into a Scientologist. But really, it’s a super rich and heavy dish, so you only need a small plateful to feel satisfied. I roasted the cauliflower to make it sweet and crunchy and I toasted the pine nuts on the stove to get them buttery and nutty. I made a creamy browned butter sauce to drizzle on top and the green olives added some acidity and bite to the otherwise heavy dish. You don’t have to use homemade pasta, but I did and I’ll show you how the making of it all went down on Friday. Hint: It was super fun. Cut the cauliflower into 1/2-inch or 1-inch florets. 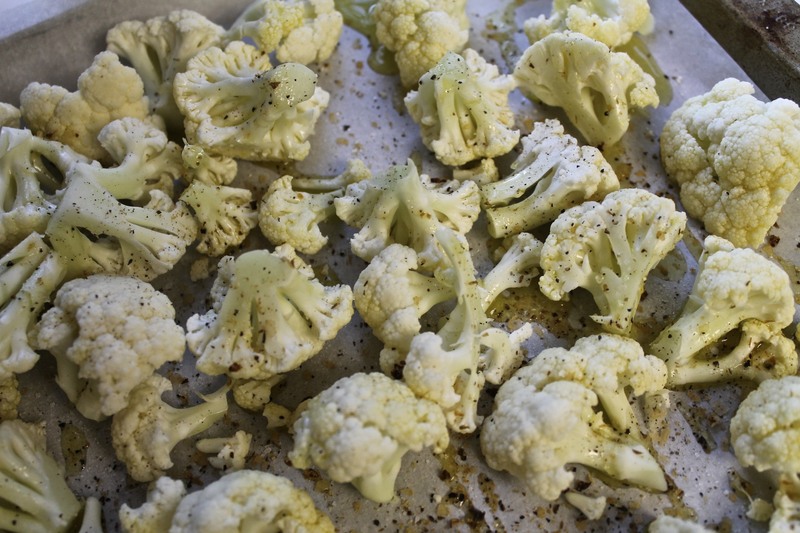 Line a baking sheet with parchment paper and add the cauliflower. Drizzle with EVOO and season with the seasoned salt. Roast in oven for about 45 minutes, or until cauliflower is browned and caramelized. 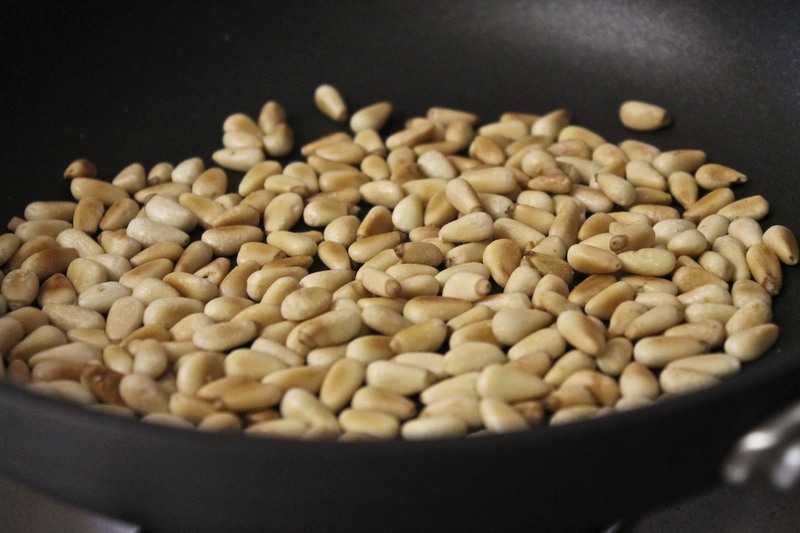 Meanwhile, in a small, dry pan, toast the pine nuts over low heat until lightly browned. Be careful to watch them closely as nuts go from perfectly browned to burnt in a matter of seconds. Set aside. Pit the olives (take a chef’s knife and turn it to its side, like you were going to smash garlic. Give it one good hard whack. The pit should pop out of the olive.) and roughly chop. Set aside. In a big pot of boiling, salted water, cook pasta according to directions. In a small pan (use the same one you used for your pine nuts), slowly melt the 6 Tbsp. of butter over low-medium heat. Add some dried parsley to it for color and cook until medium to deep brown. Click here for more instruction. Once the butter has browned, slowly whisk in the 3 Tbsp. of cream. Whisk, whisk, whisk until it has combined. This will take about 3-5 minutes. Add 1 Tbsp. of Pecorino to it and whisk again. 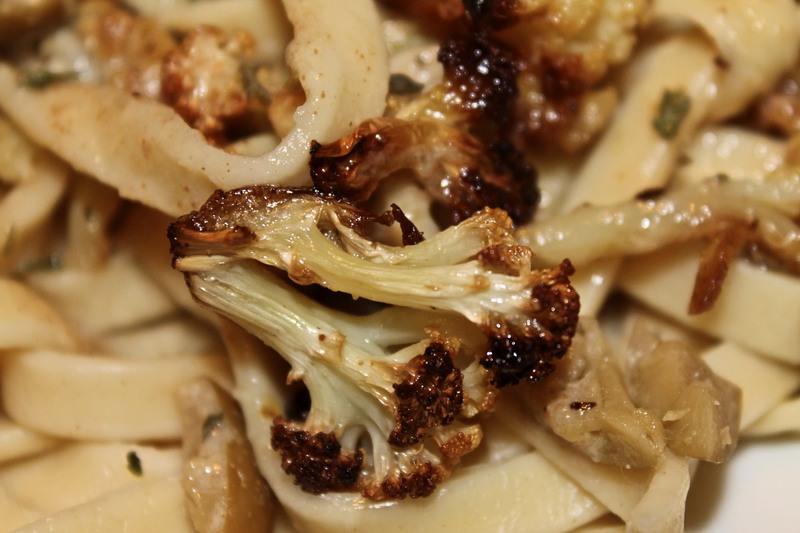 Divide the pasta into four portions and evenly divide the cauliflower, olives and browned butter sauce. Toss to coat each plate. 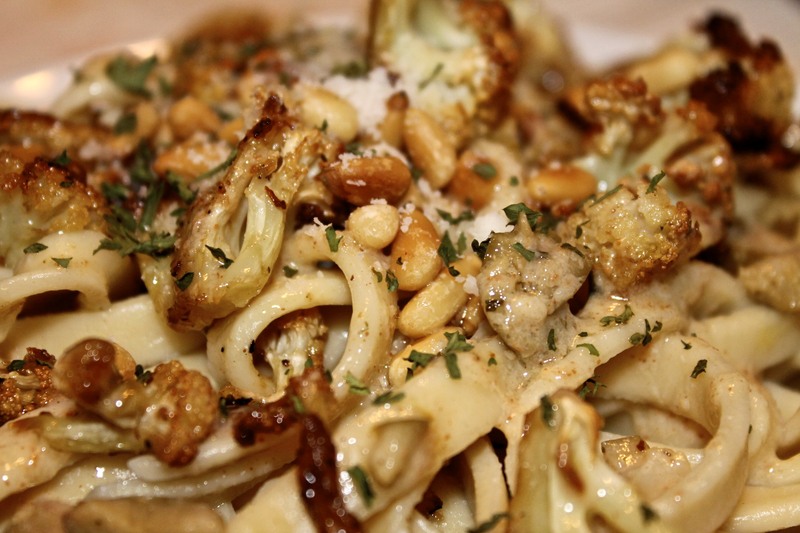 Top with pine nuts and extra Pecorino. Don’t like olives? While I’m not sure if we can still be friends, I’ll suggest you squirt some fresh lemon juice on the end result to brighten up your dish. Try this with roasted broccoli for more color. Use toasted pecans for a different flavor profile. Use Parmesan instead of Pecorino. Use goat cheese to top it off. This sounds and looks divine! Totally trying it this week! yay! Let me know how it turns out. The creamy brown butter sauce is sooo good. This looks absolutely fantastic – love that you made your own pasta! Thanks! It was fantastic. And the pasta turned out better than expected. Definitely plan on making my own pasta from here on out–so simple! Yum! 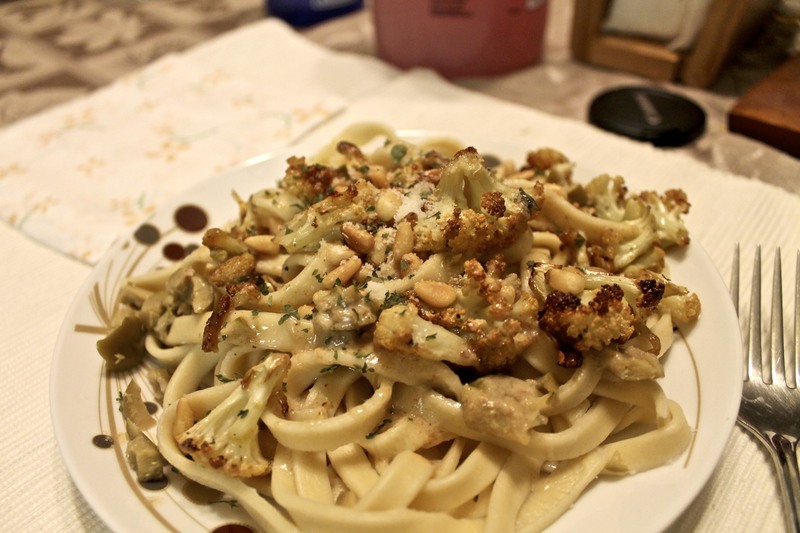 I make a pasta like this with cauliflower, olives, almonds and parsley pesto. But next time I’m going to try your brown butter sauce–that sounds amazing! Yum, love the idea of parsley pesto! The brown butter sauce is so amazing. Just make sure your only plans after eating this are lounging around. It’s extremely decadent! Thanks so much for reading!